Robin and Batman stop a suicidal man from blowing up a train and himself. Tim’s father learns that he actually owned an island and decided to buy it for a new resort location. However, their boat is attacked by a parademon and Tim is separated from his father. 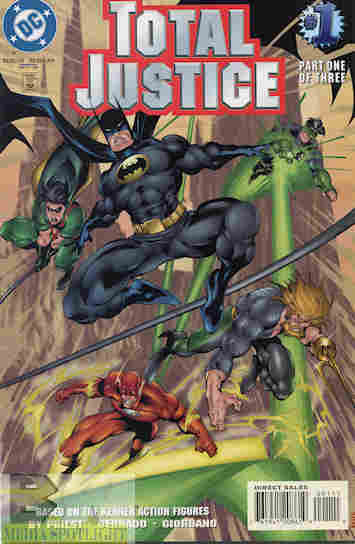 Later Green Lantern and the Flash are sent to respond to a distress call and come across Aquaman, who has come investigating the dead fish in the area. When they get to the island Kyle and Wally lose their powers and have to be rescued by Tim. Batman heads for the island while the other Justice League try to figure out how to approach since most of the assembled also have superpowers that could be knocked out. Batman arrives just as another parademon grabs hold of Tim in a makeshift Robin costume and flies him up. Robin is able to knock the guy out, but at that height they end up falling to their possible doom! What they got right: The concept is sound enough. And the heroes work to come up with a solution. Not the heroes on the island, but the heroes who have to go in. It’s a good mystery set-up. What they got wrong: The heroes seem rather confrontational with each other for not being a Marvel comic. Okay I’m exaggerating, they aren’t that bad. Aquaman was a jerk to the above sea heroes at this time (which I don’t like) but Wally really seems to hate Kyle, and jumps on his case about how he became Green Lantern while he grew into the Flash, missing Kyle’s point. I know he’s frustrated about losing his powers (but not the perception that comes with it as we’ll see next issue) but he’s not adjusting very well. The art I’m not a fan of either. Features are very exaggerated and perspective is occasionally wonky. Not the worst the 90s had to offer but not that great. Other notes: Total Justice is based on a toyline produced by Kenner (before being fully absorbed into Hasbro) in which the figures were given translucent “fractal armor” to “enhance their powers”. Some of the figures were also released sans armor in a special JLA toyline exclusive to KB Toy Works. The armor really didn’t add any features and the toyline was short-lived. Recommendation: A decent start but I’m seeing some of the things I’m not a fan of in Priest’s approach to the DC universe, even if he is a good writer. It’s worth at least giving a look. Posted by ShadowWing Tronix on March 5, 2018 in DC Spotlight, Yesterday's Comics and tagged Aquaman, Batman, DC Comics, DC Universe, Green Lantern, Kyle Rayner, Robin, The Flash, Tim Drake, Wally West.